Galay Fairydean Rovers gaffer Stevie Noble has apologised to all associated with the club for the shambolic display on Satiurday which handed a record defeat to the Braw Lads. But he is determined he won’t quit – and he thinks the side will emerge stronger from the other side of the crisis. 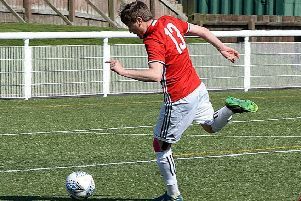 Gala FR haemorrhaged 10 goals – five in each half – to an East Stirling side who could well challenge runaway leaders East Kilbride for the Lowand League title this season. It’s only the second time in the league’s history that a team has shipped a double-figures total. But for Noble, there are to be no panic-induced changes or knee-jerk reactions – he has enough faith in his players to know they’ll respond. And he believes this may even trigger an impressive run from the Netherdale side – just as their last heavy defeat did. Gala FR bounced back after losing 7-1 to Selkirk three months ago – so they know they can do it. Many key players were missing on Saturday and a lot who had not played, or trained, for a while, had to turn out against ‘Shire. “All that has contributed and we don’t have the depth of squad,” said Noble. “I am sure the lads will knuckle down – it’s going to be a tough few weeks for us. To do well against teams like East Stirligshire, Spartans and East Kilbride, we need to to be at virtually full strength. Gala FR were hungry to pick up points in the next two away games, against Edinburgh University this Saturday and then Whitehill Welfare, and Noble was “looking for a reaction”. “Saturday’s result really hurt,” said Noble. “It hurt me and it hurt people at the club. “I am sorry for them and I’m sorry for the supporters and everybody involved.